Bragi’s first product, the Dash, was incredibly ambitious, combining totally wireless earbuds with fitness tracking and more. The Headphone, its next product, scales back the ambition but nails the core features of providing a set of wireless earbuds you’ll actually want to use all the time. The Headphone doesn’t offer activity tracking or fancy gesture controls – instead, it promises Bluetooth audio, with physical buttons on the right earbud to control playback and volume. The case for The Headphone just holds the buds for charging; unlike The Dash, the storage container does not also hold backup charge for the headset. 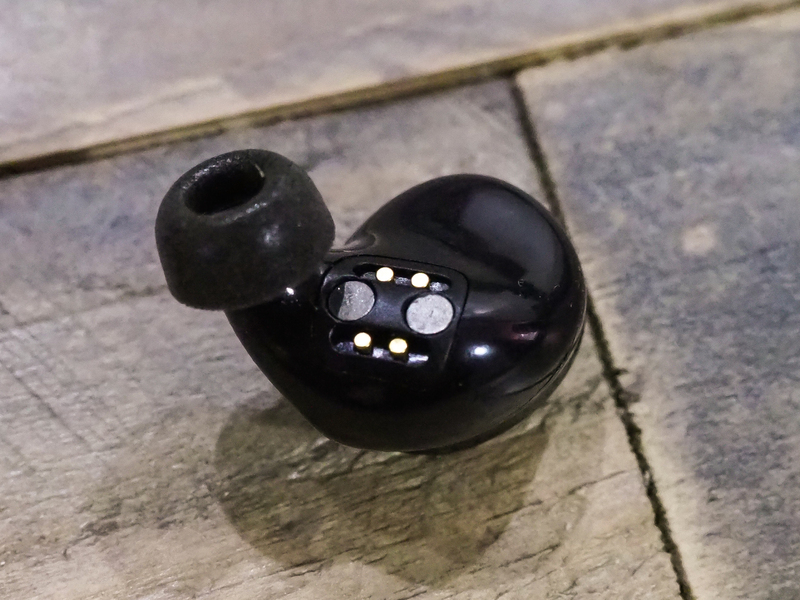 Despite everything Bragi took away with this design, what you get for the $149 asking price actually seems like a far better bargain; The Headphone’s biggest strength is solid connectivity, and it also offers a wonderful (and accurate, based on my own real-world testing) six hours of battery life. Even its microphone, which partly employs bone induction to get around the lack of any way to beam from like Apple’s AirPods or point at your mouth, works well for Siri and for calls, albeit coming off a bit “tinny” according to people I spoke to while using it. 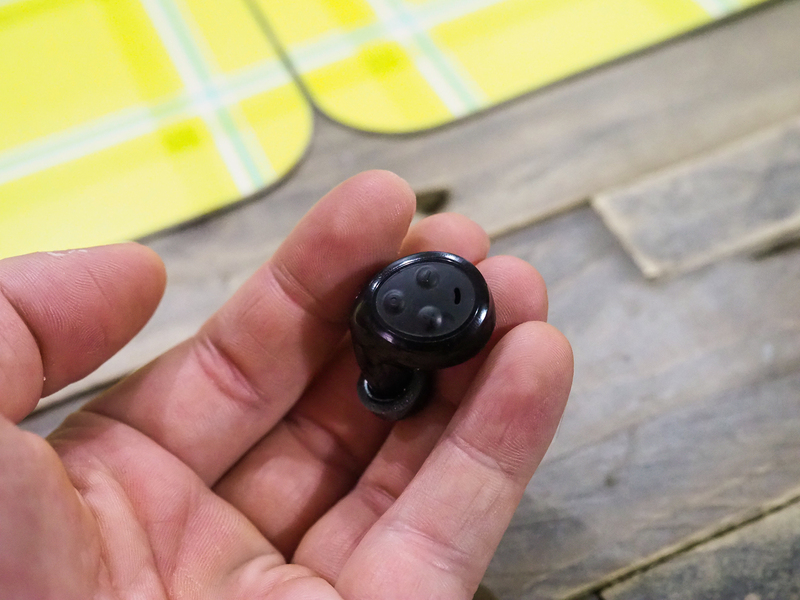 Bragi also left in an audio transparency feature that lets you activate pass-through noise channelling for times when you want to hear what’s going on around you, but don’t necessarily want to take the Headphone buds out and potentially lose or misplace them. This was amazing; I used it multiple times to order at food joints and otherwise speak to people around me, and I could hear people very well, while also keeping my voice at a normal level instead of doing that dumb near-yelling thing you do when you’re trying to talk to someone while wearing normal earbuds. To turn on audio transparency, you just hold down the volume up sound button for a few seconds. The transparency sounds a bit like The Headphone is picking up audio via its own mics and then feeding that to your ears via its speakers, which is what’s happening. This is a little weird at first but you’ll quickly get used to it, and the end result is very effective. Also, if you remove The Headphone while this mode is activated and place it in the case, it can provide some loud feedback noise, but this is something that Bragi says won’t necessarily be present in the final version. Even if it were, it’s easy to avoid and not really a noteworthy flaw. Audio quality is great on The Headphone, especially when used with the included Comply foam tips for a truly sound-isolating effect (you can still use the audio transparency function with these if you want to hear your surroundings). Users who are more familiar with bass-heavy audio from the likes of Beats and other manufacturers might find these a little lacking on the low-end, but they’re well-tuned for acoustic and tunes and more faithful audio reproduction in general. 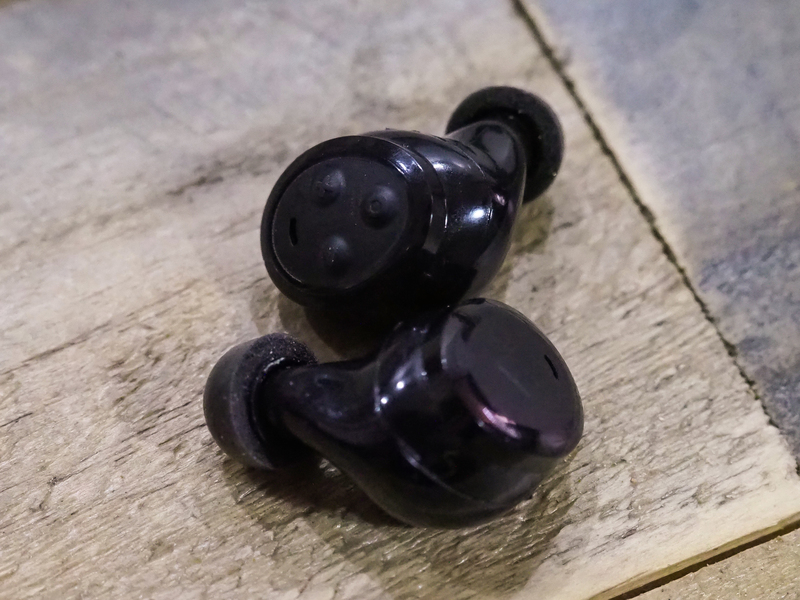 Your mileage may vary on the production version, however; Bragi noted in the review materials that the acoustic tuning was not necessarily final on this pre-release version of the product. My favorite use of headphones in general these days is listening to podcasts while in transit, and The Headphone is perfect for that, because it seems audio balanced perfectly for spoken voice. On-bud volume controls also help greatly with adapting to different listening environments, and the ability to skip forward or back right from The Headphone itself also comes in handy here. As you’re doing anything that requires using the physical buttons, though, you’ll be pushing the right Headphone into your ear, which isn’t ideal in terms of comfort but which is also more reliable than more fancy gesture-based controls. Battery life is another standout quality for The Headphone; they claim six hours of playback per charge, and I actually got very nearly six hours of use from the initial charge out of the box. They indicate battery life in the menu bar of any iOS device, and they also charge back up quickly – two hours to a full tank from empty. Bragi’s Dash comes with a case that has backup charges built-in, but they’re only rated at four hours of continuous use. The Headphone’s long life is also important because it’s actually possible and comfortable to wear them for that long – not many earbuds can claim the same, wireless or not. They fit in my ears, too, which is more than I can say for the upcoming AirPods, for instance – and again, more than can be said for a fair number of earbuds out there. 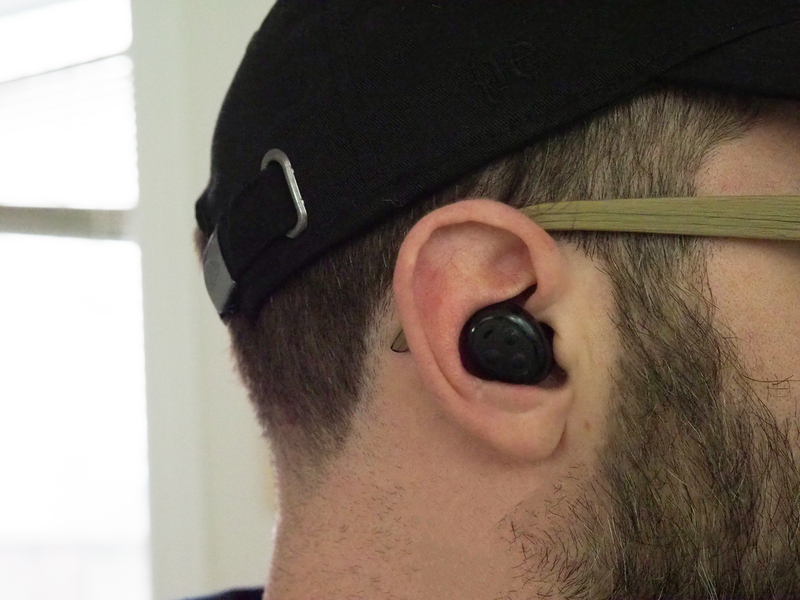 The Headphone’s fit is so good that you can use them for jogging or running, especially with the grippy Comply tips, and Bragi also says they should be fine handling sweat. Prior to using these, my favorite Bluetooth headset was the most recent Jaybird Freedoms, which are still corded between buds. The Headphone exceed those in comfort, and it’s hard to explain just how freeing it is to finally be rid of that cord. Using them feels a little like you’ve finally arrived; this is what earbuds should’ve been all along. Bragi is shipping these soon, according to the company, with pre-orders going on currently – Apple’s AirPods still don’t have a definite ship date, though, and are more expensive, too. And while there are other wireless earbuds on the market, The Headphone are the first I’ve used where I feel comfortable recommending them to anyone looking to finally, truly ditch the cord.